Culling is not an easy topic for many people. If you don't know what it means, it's simply killing or putting down an animal (In our case, birds or finches). Many breeders have different opinions and methods for culling their flock and I'm not going to go into all of that. What I will cover here is my views and my method for culling. First I'd like to state that I think culling is a last resort. I wont put down a bird simply because it's not the size, color, or shape I want. I also don't put down young birds with missing toes, leg, or an eye. Most of these birds will adapt very well to their disability over time and still make for excellent pet finches. They naturally aren't used as breeding stock in any way. I also wont put down a finch simply because it's 'getting old'. Most finches drop dead eventually on their own, when their time is up. Up until this time they still get around pretty well and are just as delightful as the day they were born. The finches I do put down are usually very sick, extremely old, or not able to care for themselves properly. I'll put a bird down when I notice it's having a hard time getting to the food and water dishes, I really don't want any of my older finches to die slowly of starvation or illness from being unable to keep themselves clean. I also put down young birds, if there is no chance of survival. 'Failure to Thrive' is usually caused by malformed internal organs and leads to a slow death in which the young chick wastes away shortly after weaning. I do not allow these young birds to linger until dead. Thankfully I've only ever had to deal with two such young birds. Over the years I've only had to put down a dozen or so finches. Before I culled my first finch I talked with other breeders to learn which method would be easiest for the finch and myself; I hate watching any living creature suffer. What did I learn from all of this; that I didn't really like any of the traditional methods. I have put a few down by drowning them, but I felt so bad for the finch as it struggled to breathe. I even took one to my local Vet and had him put the finch down, which cost me $30.00. It was time to get creative and work out a better way to cull. This may sound bad, but what I have come up with, along with the help of a few friends, is a birdie gas chamber. It's not as horrific as it may sound. The chamber itself is a cake container which came with the the cake I bought at KFC. My parents bought my latest birthday cake from KFC. It was very good cake, a small cake with a small plastic cover. Tiny holes were punched into the bottom to allow the Oxygen to escape. 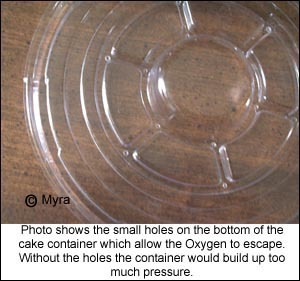 A larger hole on the side was cut just big enough for a piece of tubing to be fit securely to the cake container. The gas used is Helium. Now who hasn't taken a Helium balloon at some point and inhaled some of the gas. You get a little dizzy and your voice becomes a higher pitch (because Helium is lighter than Oxygen), but it doesn't really irritate the lungs at all. The finch is placed into the cake container and it's snapped shut. Then the gas can be squirted in from the same type of regulator used to fill balloons. The gas travels from the tank, through the tube, and into the chamber. Oxygen is forced out through the bottom holes and the finch gets a little dizzy then pass out. Death usually occurs within 30 seconds. 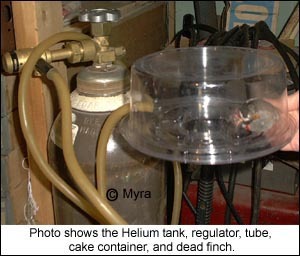 You also don't need to keep the Helium flowing, after the initial burst to fill the container you only need a few short squirts of the gas to maintain the Oxygen free environment. The finch passes out, twitches a little as the muscles spasm at the moment of death (very natural) then it's over. I do leave the finch in the container for approximately 5 minutes to ensure the bird is really dead. Rather be sure than have one ticked off finch. 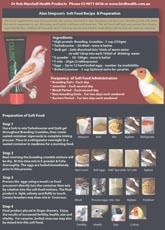 The whole process is quick, clean, and best of all it's pain free for the finch. No suffering, no panicking, just the way it should be when it's time.